Mix all above ingredients in a bowl with your hands until very well combined. The mixture will feel a little wet, but not dripping. If you think it’s too wet you can add a bit more breadcrumbs. Roll into meatballs, I usually do them the size of a ping pong ball, and place them into an oven safe baking dish (yeah corning ware). Whisk together all sauce ingredients in the bowl that you mixed the meatballs in (this will grab any of the little bits left behind. 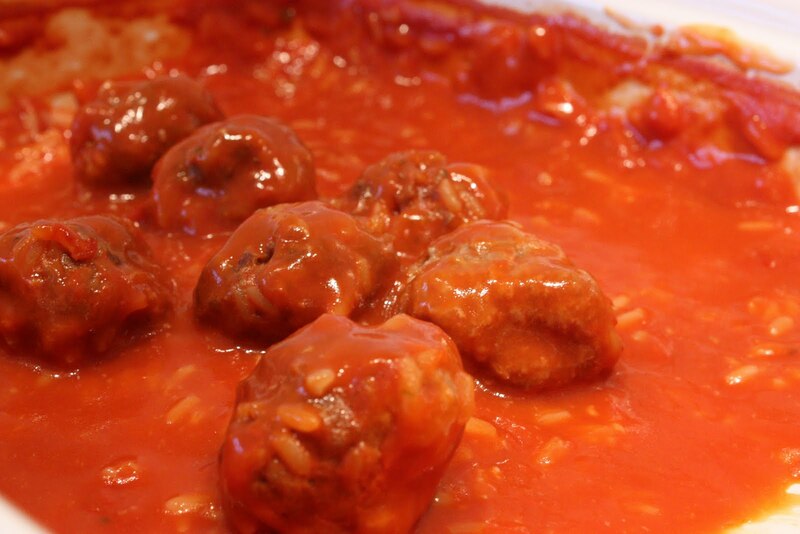 Pour the sauce over the meatballs, then spin the meatballs around a bit to cover them in the sauce. Cover the dish with foil and bake for 1 hour in a 425 degree oven. Serve this up with bread to dip in the leftover sauce and you’re laughing! Leftovers are fantastic the next day for lunch too! What’s left of our porcupine balls. I was hungry, so no photos until we entered leftover territory. 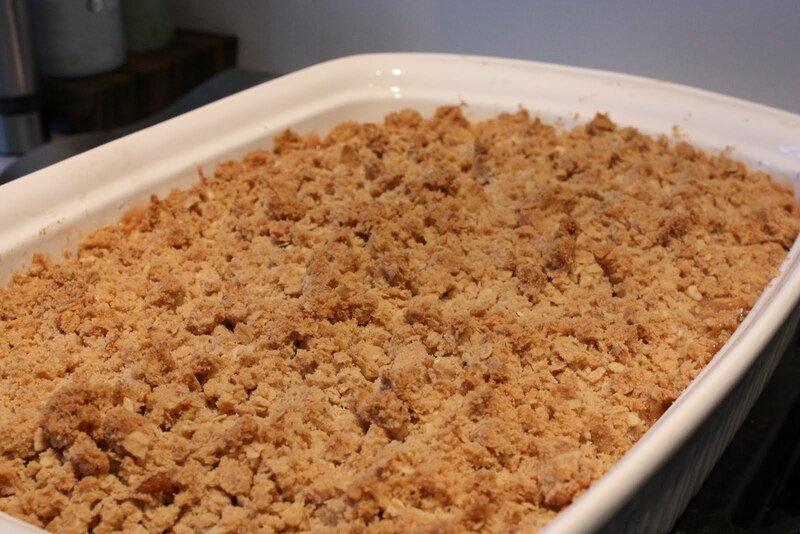 This is by far the best apple crisp I’ve ever had, another of my perfected recipes! Bo and I like lots of topping though, so if you don’t you’re weird you can cut it in half. Put the apple slices into a large oven safe dish (I use a 9″ x 13″ corning ware). Whisk together the sugar, flour, cinnamon and nutmeg. Pour the sugar mixture over the apples, then toss to evenly coat. Pour the water over the apples, do not mix. (If you like your apple crisp more juicy, you can up the water to 1/3 or even 1/2 a cup without ruining the crisp, I just prefer mine only a little juicy, with apples that still have some bite). Whisk together everything except the butter so it’s well combined. Pour the butter over the mixture and combine with a fork or your hands (which is way faster), until there are no dry bits left and it comes together is small clumps in your hands. Evenly sprinkle the topping over the apple mixture. Bake, uncovered, in a 350 degree oven for 45 minutes until brown on top and bubbling at the edges. Let cool slightly, and enjoy! Your kid is so cute. Anyway, I just tried your apple crisp recipe and it's awesome. My kids were practically devouring the bowl. They begged me to prepare it again any day this week. Thanks for sharing.